Hotel Kumbhal Castle is wonderful heritage hotel in Kumbhalgarh, owned and managed by Mr. Ekling Singh Jhala. 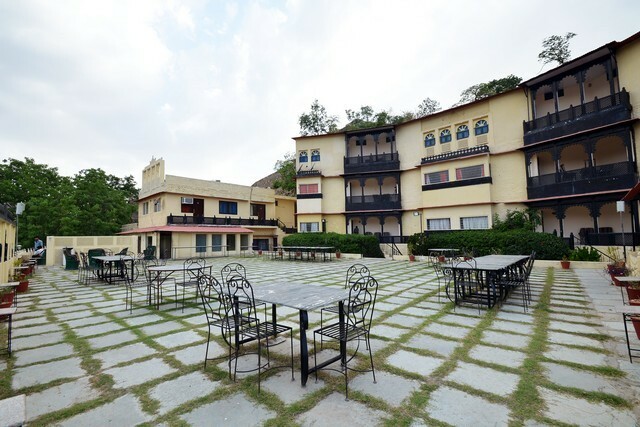 In the journey of last 12years, Hotel Kumbhal Castle has served thousands of guests. We had started with a small property with 11rooms but now we have expanded upto 22 guestrooms and in process to launch tented accommodation in the next tourist season and a very unique Wildlife & Nature Museum shortly. Our hotel is best suitable for both, business and leisure travellers. We offer every possible regular service & facility. Our rooms are spacious and comfortable offering valley view, bathrooms are neat & clean. Delightful Restaurant, refreshing swimming pool and overwhelming services by our friendly staff, makes your stay more special. Complimentary Newspapers in Lobby, Internet/Wi-Fi, Disabled Facilities, Parking, Gardens, Safe Deposit Box-Front Desk, Front Desk, Major Credit Cards Accepted, Travel Counter, Baggage Storage on Request. Air Conditioning Room, Complimentary Newspaper, Refrigerator Room, H/C Water, House Keeping, Reading Lamps, Daily Room Cleaning, Complimentary Toiletries, Attached Bathroom, Basic Bathroom Amenities. User reviews for "Kumbhal Castle Hotel Udaipur"